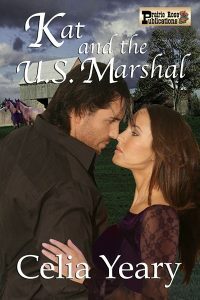 U. S. Marshal Diego Montoya rides into Old San Antonio on an assignment to track down and arrest a swindler and killer. That's his job. But his first goal is to visit beautiful Katherine Garrison, the woman he loves, to learn if she will welcome him. Kat Garrison answers the door, thinking her gentleman friend has arrived early. When she sees Diego Montoya instead, she can't believe he's standing on her front step. All she can think of is their encounter in the barn that cold December night, while her brother and new bride occupied the house. While carrying out his mission, Diego becomes involved with Kat. But can a beautiful society lady really love a homeless rough lawman enough to take a chance on a life together? Marshal Montoya always gets his man, but can he capture Kat's heart?